Our Alicante cruise port guide gives you information about the docking location, cruise dock, transportation options and much more! Welcome to the Alicante cruise port guide. 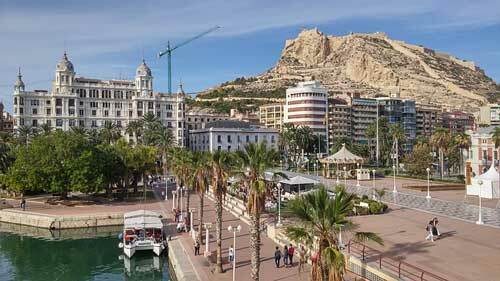 Alicante is a town is southern Spain on the Costa Blanca. According to the locals it is the friendliest city in Spain! Due to its history it is a city that lives! Alicante offers a charming old town with new treasures to explore on every corner. One of the great highlights is the Santa Barbara castle which sits high on the Benacantil hill. This magnificent medieval castle is one of the best of its kind in the country. Even for those who would rather plan a chill day: this city is known for great shopping oppurtunities and some of the best beaches in Spain. 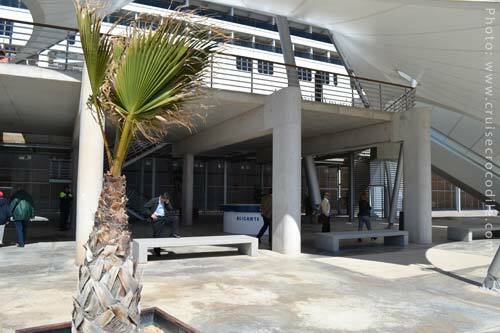 In front of the Alicante cruise dock you will find a modern cruise terminal. 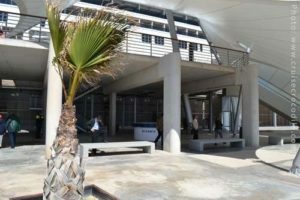 The cruise dock in Alicante is around 1,5 km walk from the city centre. There is a free shuttle bus and there might be one or two taxis at the dock. 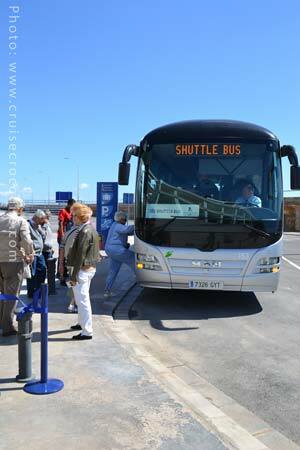 Take the complimentary cruise shuttle bus to Alicante city centre. 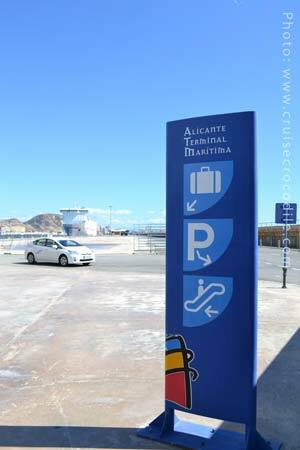 Your cruise ship will dock at the Alicante cruise terminal maritima. The cruise dock is approximately 1,4 km long. 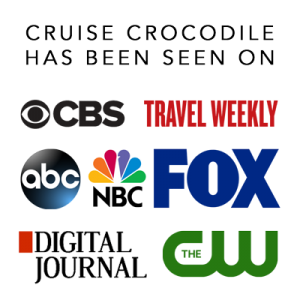 There is a cruise terminal with limited facilities. To get to the city you are either free to walk or take the complimentary shuttle bus to the city centre. See the drop off location marked on the map above. Find the closest tourist information point close to the shuttle bus drop off location. Alicante has a hop on hop off bus. Find it close to the shuttle bus drop off location. Buy an all-day ticket at the bus and visit all the mayor sights in town. The castle on top of mount Benacantil can best be reached by elevator. Find the entrance to the elevator close to the cruise shuttle drop off location. See the exact location marked above. The nearest beach to the Alicante cruise dock is Playa del Postiguet. This beach a few hundred yard walk from the cruise shuttle drop off location. This city beach has a lovely beach with lots of facilities. Find the exact location of the beach in the map above. Sitting high above the city on mount Benacantil is the castle of Santa Barbara. This fortress is of Arabic origin and one of the largest medieval structures in Spain. There are lots of things to do here! Please know the easiest way to get up is by elevator. Alicante’s famous boulevard is the Paseo de la Esplanade de Espana. This beautiful pedestrian street is made up of 6.600.000 mosaic pieces. It is made up of three colors. The red is called red Alicante and can only be found in this area. Walking the Paseo de la Explananda de Espana is a must. You will see street artists, souvenir shops and especially a lot of locals deciding to catch up on their local gossip. Cruise ships dock at the Alicante cruise terminal maritima. This is a long cruise dock in front of the city center of Alicante. Take the shuttle bus right to the city center. Visit our Alicante cruise port guide for all the information on Alicante’s dock, transportation options and what to see and do. Alicante is known for its beaches. Playa del Postiguet is one of the best and closest beaches to the cruise terminal. If you are in the mood for a beach day, this would be the way to go.